through a cable (umbilical string)with the capacity of the computer that controls him/it. 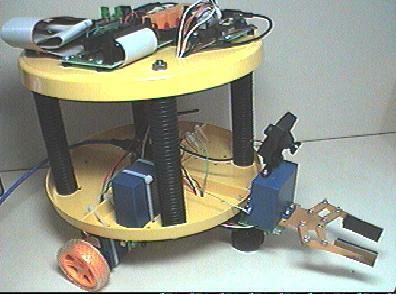 automatic way the robot walks for the ground straying of obstacles, sending messages of voice. of the camera it is necessary to install a plate of entrance of video sign in the computer. The control of the camera and gripper is made through servants used in small parabolic antennas.